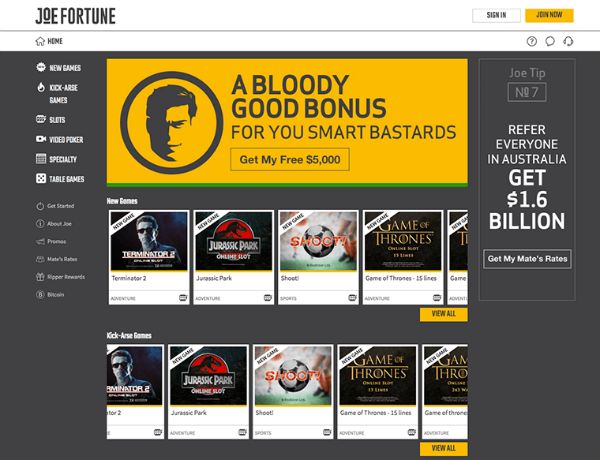 Meet Joe Fortune – fresh, new, Australian online casino brought to you by one of the biggest gambling companies. Joe Fortune casino, launched in August 2016, is focused strictly on Aussie gamblers. 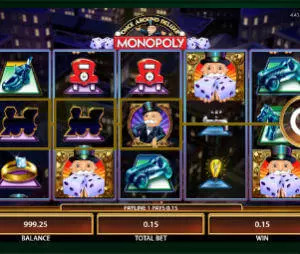 With superb variety of pokies, fast payouts and superb customer support, we expect it to become one of the leading Australian gaming destinations. Joe Fortune offers a nice combination of familiar developers, such as Microgaming, with software providers that so far skipped the Australian market, such Rival, RTG, BetSoft and Spinomenal. Of course you can also enjoy other casino classics such as video poker, roulette, baccarat, craps and blackjack. Btw, Joe Fortune casino offers the lowest house edge blackjack game you can find: Single deck blackjack with just 0.08% house edge. Well established Australian online casinos tend to become quite stingy when it comes to bonuses. Here enters Joe Fortune casino with $5,000 bonus package on your first 9 deposit. Of course, nothing comes for free. The wagering requirement here are 40 times on bonus + deposit, which is above industry average. On top of that, players can enjoy daily cashback of 10%. The way it works is that you can request cashback each time your balance is below $10. You will be give 10% of your deposits minus your withdrawals; since your previous cashback of course. Joe Fortune offer a very generous refer a friend bonus. You will be given $100 free for every new member you bring to the casino. Plus, your friend will be given a $10 no deposit bonus to check things out. (And of course the $5000 welcome bonus). The weakest link of Joe Fortune casino. You can deposit only using Visa or Mastercard. Those of you that are more advanced when it comes to use of crypto-currency can also deposit with Bitcoin. We hope more methods will be added soon. The minimum deposit is $25 and it goes up to $1,000. Withdrawals can be done only with bank wire, courier checks and bitcoin. Minimum withdrawal amount is $20 and the maximum is $9,500. The withdrawals take a bit long, 4-5 days, besides Bitcoin which are done instantly. You can contact Joe through Live chat, contact form or toll-free phone number. Live chat + phone option is available from 8AM till Midnight, AEST. To be honest, we are pretty excited from this new brand: it’s a bit different from what we used to see on Aussie market. In a good way. Operated by the people behind Bodog and Bovada insures that you will get the best treatment in terms of support and fairness. The main drawback is the limited deposit and withdrawal methods, but we hope that in few days/weeks they will add additional options. Other than that, we find Joe Fortune casino highly recommended.